Parks in Bangkok are often the center for all sorts of activities. If you're going to be in Bangkok for a while and looking for exercise, you can find just about every form available in many of the major parks. This includes aerobics, tennis, basketball, weight lifting, rowing and no doubt many more. There are many small and out of the way parks. The spaces listed here are the ones most accessible to visitors. Some of the many mature trees within Lumpini Park. 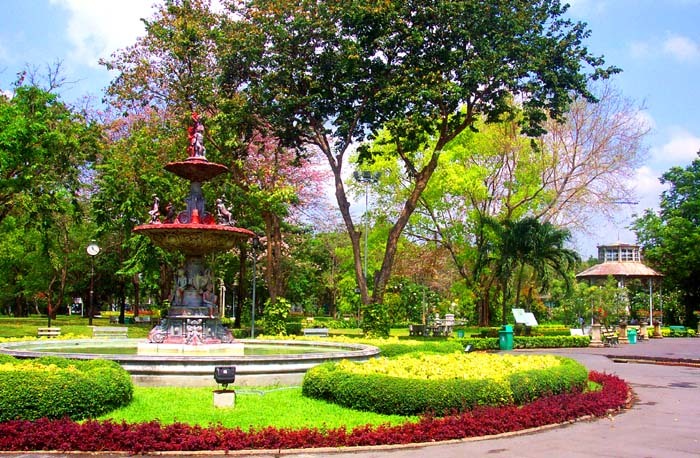 One of Bangkok's oldest, biggest and most visible parks, Lumpini Park is definitely Bangkok's "central" park. Concerts and other events are often held here in the cool season, and you can find just about every activity imaginable here, including a library. Read more about Lumpini Park in our online article. If not staying at one of the nearby hotels, you can take the Skytrain to Saladaeng station or Subway to Silom station and walk the short distance there. Built in 1992 to celebrate the Queen's 60th birthday, Benjasiri is often referred to as "Queen's Park." This is definitely the place to be for sculpture lovers, as several of the best examples of Thai sculpture are scattered around the park. Benjasiri Park is located next to The Emporium shopping center on Sukhumvit Road. You can take the Skytrain to Prompong station for instant access to the park. Most people have heard of Chatuchak Weekend Market, but next to the market is also a large park, popular with young lovers. Recently, the old railroad golf course adjacent to the park's north end was turned into a public park, with many tennis courts and soccer fields available for anyone to use, so now there are three parks in Chatuchak district, each with it's own character. Like the market, you can catch the Skytrain to Mo Chit station. The park is right at the station's exit. 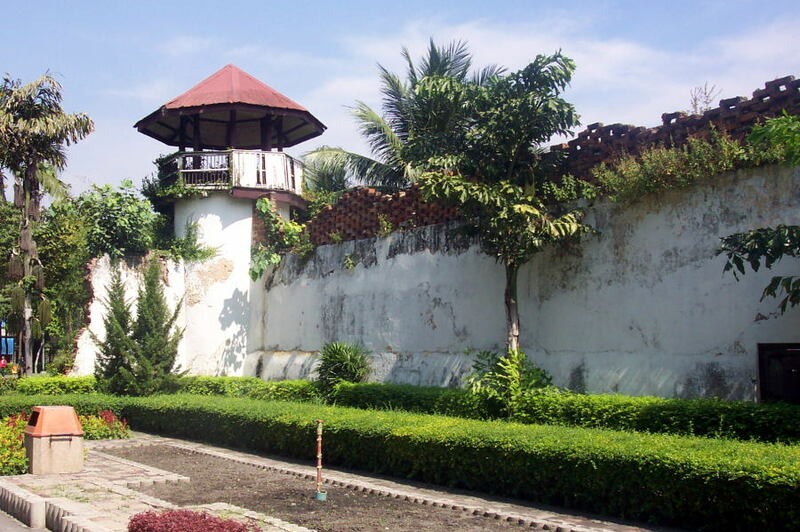 The eastern wall of the old jail, now the site of Romaneenart Park. 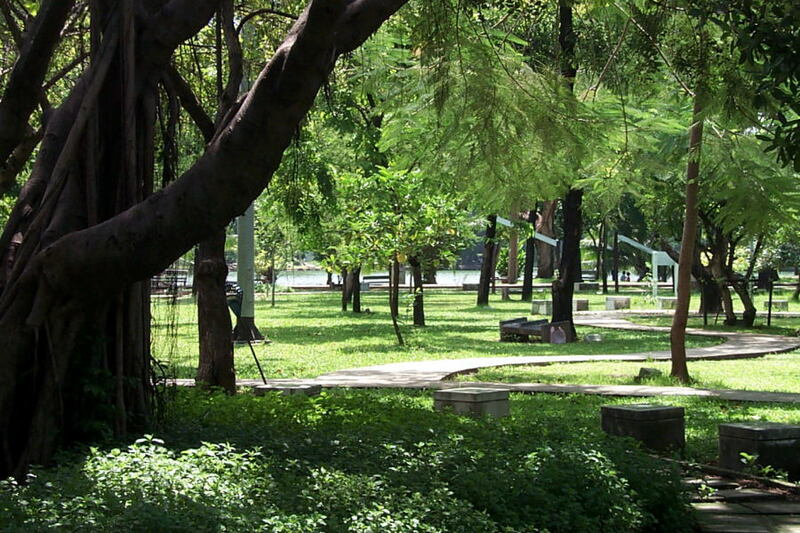 Close to the Giant Swing and Wat Suthat, Romaneenart Park is the only non-ceremonial park in the center of the city. The park is less that five years old, and was built on the site of the old city jail. One wall and some of the old guard towers have been retained and made part of the park. A large number of fountains help keep the park cool in the middle of the big city. The park features some basketball courts, a playground and a sort of "muscle beach" area for weight lifting. Romaneenart Park is on Siriphong Road, which runs from Wat Suthat down to Pahurat Market in Bangkok's Little India section, next to Chinatown. You can get to the park by express boat to Memorial Bridge pier, then walking up Chakraphet Road. Phra Sumen Fort in Santichaiprakan Park. 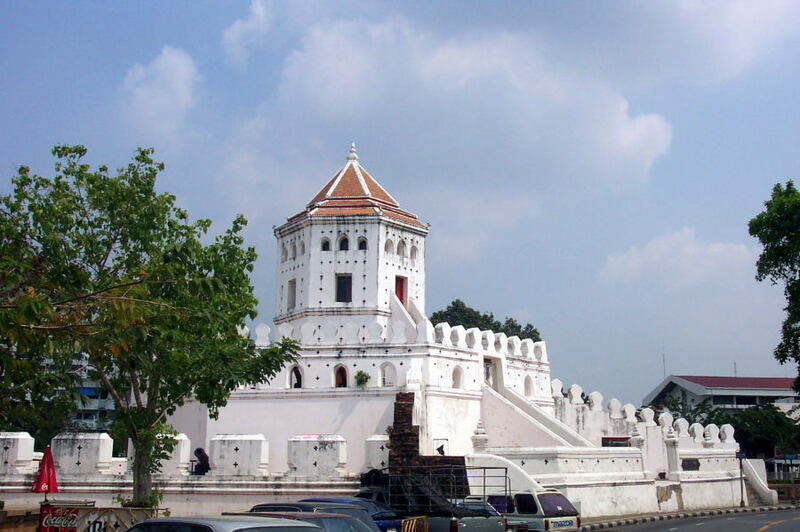 Built around one of the few remaining structures of the old city fortifications, Santichaiprakan Park have become very popular with tourists and city dwellers, especially in the evening when the park fills up with families as well as foriegn buskers attempting circus tricks. From the park, a riverside walkway leads south to Phra Pinklao bridge and beyond. The park passes many historical buildings, now occupied by the likes of the FAO and UNESCO. The park is on the river-front side of the infamous "backpacker" area of Khao San road. It can easily be reached from Khao San, or by express boat to Banglampoo Pier. The main fountain of Saranrom Park. Diagonally opposite of Wat Po and across from the rear of the Grand Palace is an almost forgotten shady oasis known as Saranrom Park. The park makes for an interesting place to rest if you're trying to explore the old royal city beyond the confines of the Grand Palace and Wat Po.